There was a time, not too long ago, when I would love a foundation so much, then out of the blue, it would just stop working in my favour. I had no idea why until one day I realized it was due to the change of weather. Just like how you need to switch up your skincare routine with the seasons, the same thing goes for foundation. One foundation that I always pull out when the weather starts cooling down is the Too Faced Born This Way Foundation. If you've been a reader of mine long enough then you know how much I hate this thing during the hot months, but extremely adore it in the Autumn/Winter time. I have no idea why, but this foundation works so much better on me when my skin gets dry (usually in cold weather) compared to when it's hot out. I'm not an oily person, but whenever I wear this, my skin looks so oily after only a few hours. So I like to pull this out during this time of year since my skin does go on the drier side and my skin will look like it's regular self with this on. Next up is the ever-so-famous - NARS Sheer Glow Foundation. I'm so late on this bandwagon, but I finally jumped on & I'm kicking myself for not trying it sooner. It's such a stunning foundation. It has fantastic coverage and on the skin, the finish is beautiful. The only reason I don't pull it out in the Summertime is because it is a tad too heavy for my liking during that time. I usually go for foundations that feel like nothing when it's scorching hot. But now that the weather is nice and cool, I don't mind the feeling so this will be a staple. 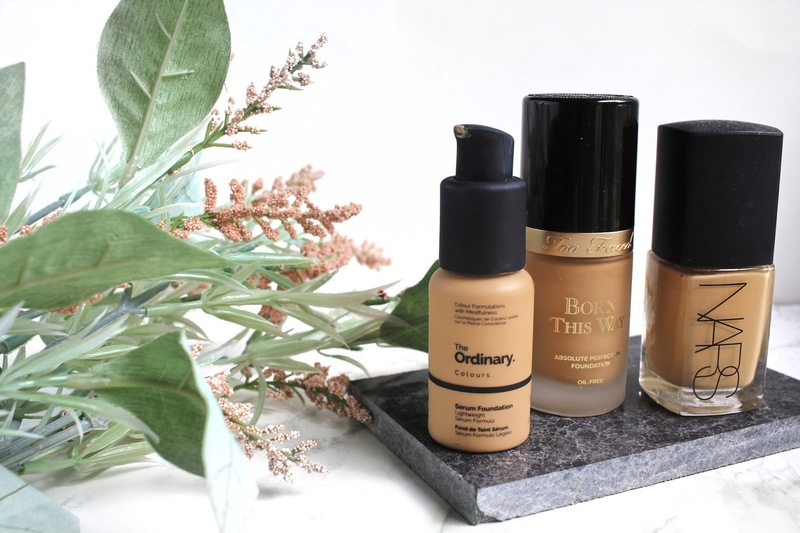 Last is The Ordinary Serum Foundation. This has actually been a favourite of mine throughout summer and I couldn't bring myself to part ways with it. It's such a gem. Right now, mother nature has been on her period, so the weather we've been having is so bipolar. One day it's cold, then all of a sudden it's hot again. So until that gets all sorted out, the wonderful Serum Foundation will be one of my go-tos! What are your favourite foundations to turn to when it gets cold out?